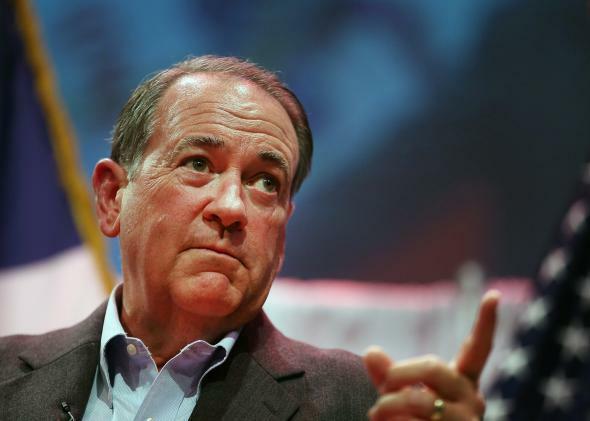 Mike Huckabee speaks at the Point of Grace Church in Waukee, Iowa, on April 25, 2015. [These] ordinances [say] if your 7-year-old daughter—if she goes into the restroom—cannot be offended and you can’t be offended if she’s greeted there by a 42-year-old man who feels more like a woman than he does a man. Huckabee has long enjoyed bashing gay people and marriage equality, but this disgusting joke suggests the former Arkansas governor has lately discovered the joys of ridiculing trans people—who already face a stunning amount of discrimination and harassment. For what it’s worth, no state that has passed trans protections has seen Huckabee’s bathroom fever dream come to pass. But, of course, Huckabee isn’t really concerned about facts: He’s concerned about finding the kind of red meat Republican voters still care about. It seems that, by his calculation, maligning one of the most reviled and marginalized groups in society will still push GOP voters to the polls. Update, June 3, 2015: This post has been updated to reflect the fact that BuzzFeed first flagged Huckabee’s comments.